Look what Hub brought in! Kinda….meh. I think they were a little too crowded in there, but I didn’t wanna change one thing about them. But now I’m wondering if these quick watercolor sketches are useful to do daily. Should I work on a bigger project? Not sure I’m ready for that. I’d welcome your thoughts! Happy Independence Day! Have a safe and happy one. Peace. Thank you, Debi! That’s just what I need, some guidance as to how to tweak things. I appreciate that very much! One question: do you think I should try to work on something larger? I’m wondering if I’m ready for that. I want to do a seascape, and I could follow a video tutorial….but I’m afraid I’ll mess it up royally. Or I could try larger without a tutorial…..but back to the fear of messing it up totally once again! Hey Laura – your question was to Debbie, and I know zero about watercolor – but painting is painting. I say, go for it. Go big. Buy a pad of 18 x 24 watercolor paper. Do a small sketch of your seascape to solve the compositional problems, values, color choices, etc. then make an 18 x 24 watercolor with your sketch as a guide – being open to change and the serendipity wonder of watercolor. What do you have to fear?? Your investment is materials and time. We adults learn by doing. Even when we fail, we learn. And we’re one painting closer to success : ) Go for it! Thank you, Tom! I appreciate the vote of confidence, and you taking the time to comment. I am definitely considering working on a larger project. It’s percolating. I think of you often – “progress, not perfection”. It helps a lot. Your work is beautiful, and I so admire it. I hope you have a terrific weekend! I like these quick sketches. 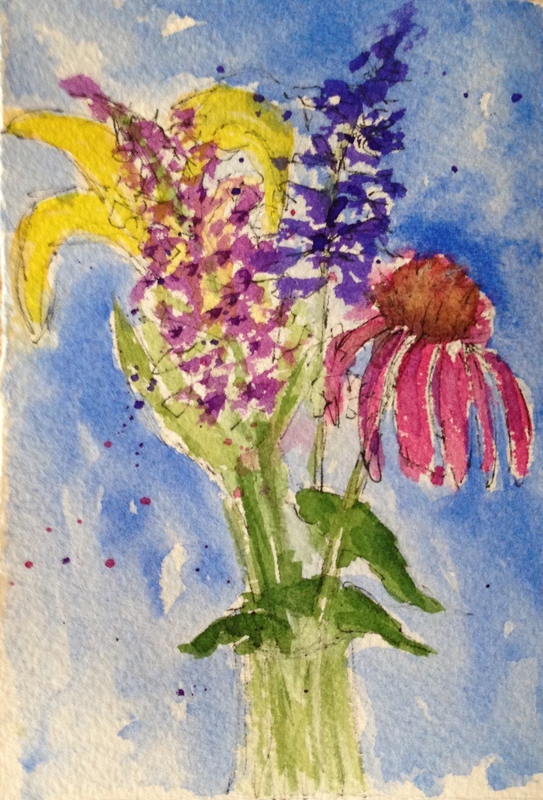 I find flower groupings difficult, especially in color…rendering yellow flowers at all is still a mystery to me. The little glimpses of yellow in the back here helps define the other flowers. Keep going, I say. It’s not a steady progression upwards, but zigs and zags. One day you will look back and be amazed. I’m really glad you think so. I was a bit discouraged after painting last night. Doing one object on a background is one thing but the idea of putting a whole painting together…..yeah it just seems like climbing Everest. I’m searching for an in-between. Still a challenge, but not a marathon run would be good. Maybe I should stick to single objects, but I don’t find much life in things. Maybe birds? I totally agree re yellow flowers. And lilies….forget it. They looked good in the bouquet, and smell wonderful, but they’re crazy hard. I turned the vase to the back immediately. Ah yes, composition. I need to work on that myself. I should give those family groups another try. Thanks, Steven! I’m glad you enjoyed it. Color is so wonderful. And I really enjoy being able to mix them and make anything I want. 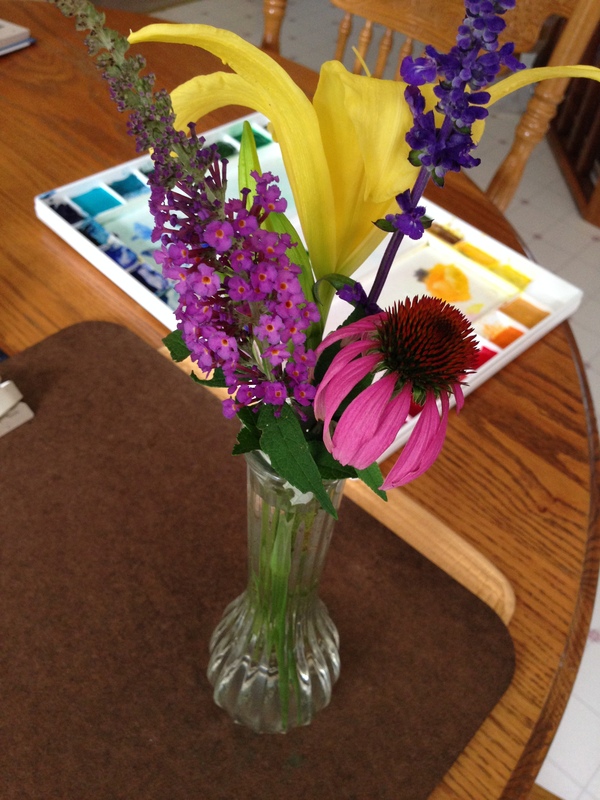 Great husband to bring you flowers and kuddo’s to you for painting them! Wonderful work on this lovely bouquet Laura! Would it be possible to pick something with a lot of little parts, and then break down the bigger project into painting those various segments? That way you’d have a little thing each day but they’d add up to a big thing. A garden, a family of birds, a family of kittens, etc. might be good candidates for that. If it’s either/or, I don’t know. On the one hand I like seeing your watercolor sketches every day, but on the other hand I don’t want to dissuade you from trying something bigger if you want to! You raise a good point there. And I’m happy you are enjoying my sketches! Hmm. I need to think some more. Watercolor birds would be cool. I need to think more on it. I want to get to beach art. That’s where I’m headed, but water seems a bit out of reach. I’d like to feel Iike I was working more toward beach subjects. But maybe anything you paint is moving you along, so maybe the subject shouldn’t matter much. From my perspective, that’s a pretty compelling image you’ve created. I like the Charles Reid thought. I need to check this out. just google him? Ann did, on youtube, I think, and found lots of free videos. I found out about him through Artist Network TV ($19.95/mo for all the art videos you feel like watching). But she found links on youtube – I think many of them are clips of the Art TV versions. Thank you, Jill! You are so brave; I’m not at all surprised you feel this way. Thank you for your guidance. I just might do it!! Great job Laura! Love debs advice too!! Hey 4th from cleveland! I will!!! 😄 Can´t wait!!! Don’t leave off doing flowers. But plan more carefully and think of the design. Maybe do a couple negative shape paintings first? What a sweet hubby to bring you flowers to paint. This is perfect, and beautiful even all close together. That is what I love about growing as an artist. You learn what you do and don’t like for your next projects. Have you decided to go for a larger painting? I do encourage you to try something larger… even if it will take more time than one day. I have so many abandoned pieces of art laying around my studio that I still like to pull out here and there to keep working on. I still prefer to keep my drawings small so I finish them. 🙂 Can’t wait to see what you will create if you go for something larger… maybe mountains? Thank you so much! I would love to go for an 8 x 10″ seascape. I would need to lean heavily on a tutorial though. Beach art is what calls me the loudest. Actually, mountain and beach would be great. Vacation spots, lol. 8 x10 is a great next step for a larger size. It can be overwhelming at first, but still a nice size. Thank you. Yes, it is a bit overwhelming! It’s like opening a journal and not knowing how to fill the page! hehe. Laura, I wouldn’t change a thing about this picture either. Love it. Your hubby sounds wonderfully supportive.